For a while, it was just me – hunting, painting and staging. Then Aaron started to help and we were able to accomplish triple. Yep, he’s just that good. Now we’ve added a third person! Allow me to introduce another face behind Classic Cottage Co. – Meet Breanna!! We’ve been thinking for months about hiring someone and each time we would think about it, Breanna came to mind. Right around the time we were ready to take the plunge and hire, Breanna was looking for a job. 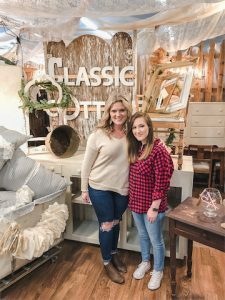 No doubt, we can already see she’s a great addition to Classic Cottage Co.. Breanna has an awesome work ethic and is always a bright ray of sunshine! Oh, and she has a new found love for French Provincial pieces! Breanna will be helping us share behind the scenes on our social media, answering some support, preparing pieces for the booths, and helping with the online store. Yep, she’s gonna be busy & such a great help to us!